As usual, it's been a whirlwind of activity since getting back from my recent Palau trip. In particular, I've been typing franctically to catch up with months of email backlog. The end is within sight, but for every email I manage to slay, it seems that at least three more emerge like menacing beasts from nefarious nether regions of cyberspace. In addition, I've been trying to get organised with my trip schedule for 2013. It's looking like I'll be on the road pretty much constantly from mid-January onward, perhaps all the way through January 2014. As of now, most of the spaces for the trips I have planned are taken. If you're wondering how spots can already be taken when I haven't announced trips yet, I usually send emails in advance of posting trip information to friends who travel frequently with me (i.e., gluttons for punishment); anyone who has contacted me about specific destinations; and then to my trip newsletter list. In many instances, trips fill during that process. Following on our successful joint trips to Alaska this year to see humpback whales feeding and to Tonga to throw Jon in the water with whales, Jon Cornforth has decided to risk spending more time with me. Pity the fool. As part of his relentless "Tony, you have to do some cold-climate stuff!" campaign, Jon has convinced me to travel even further north than Alaska, to Nunavat, Canada…which, as I understand, is in the Arctic circle. I've avoided looking at a map to pinpoint the precise location, for fear of getting cold feet, figuratively and literally. 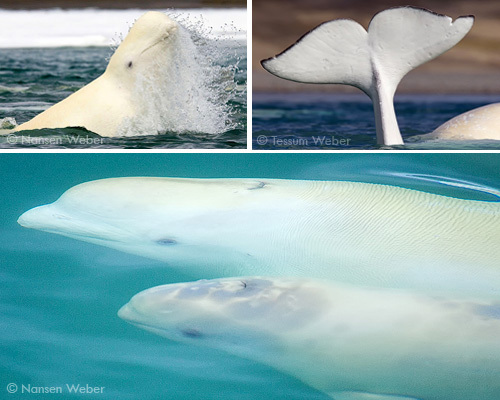 Our purpose in heading to the Great White North is to quaff a Molson or two in situ frolic with beluga whales (Delphinapterus leucas), which have got to be among the cutest, most charismatic animals in the ocean. We won't be getting into the water, but we will be photographing the belugas as they come in close to shore to socialise, rub against rocks on the river bottom to slough off skin, and just relax in the relative safety of shallow water. If you've seen BBC's Frozen Planet, this is the location where the outstanding beluga sequences were filmed. 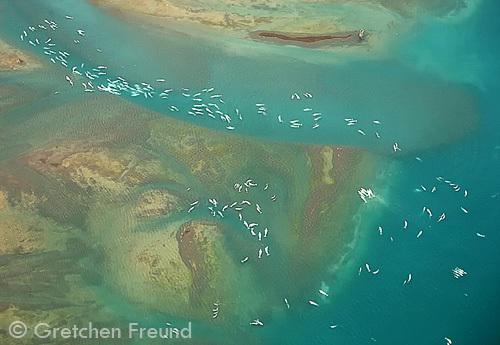 There is a river that runs into the sea, and thousands of belugas gather here for a short period each summer. Even though we won't be getting into the water, we will of course be attempting to get underwater photos and video with various contraptions we're cooking up. We will have access to kayaks as well. 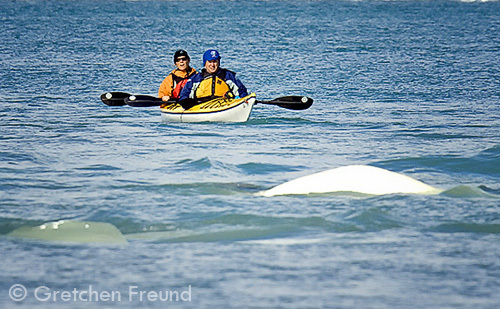 I hear that the belugas will often come right up to kayaks. Plus, with the near perpetual golden-hour light, there will be ample opportunity to take photos of topside wildlife and gorgeous landscapes. The dates are 26 July to 02 August 2013, and the point of departure is Yellowknife, Canada. We will be taking a charter flight from there to the lodge where we will be staying. There are three spots is one spot left for this trip. Jon is coordinating this outing, so please feel free to contact either one of us for more information. 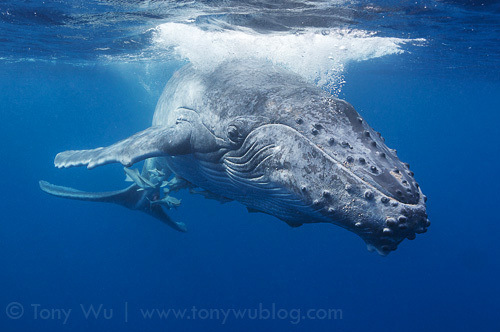 I'll be heading back to Tonga in 2013 for my 12th season there! I've written a lot about Tonga, so if you're interested in reading more about the destination, the encounters, etc., please look back in my archives for previous posts. 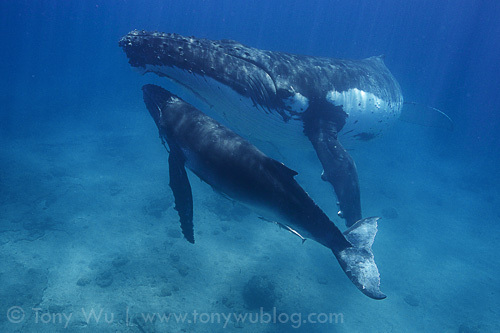 Also, for great background reading, please refer to my most recent humpback whale calf count file. 3-10 Oct: I'm considering adding this itinerary as a special trip, limited to just four spots (one spot taken). I ran a similar trip this season, with a fantastic group of people. A small group like this means you can get into the water every time an opportunity presents itself, but it also means each day can be physically taxing, so this would be a trip most suited for experienced swimmers in reasonable shape. Please contact me via my contact form if you're interested in the above itineraries, and sign-up for my trip newsletter if you'd like early warning of future opportunities to get abused by me excursions.